Andrei Tarkovsky's Андрей Рублев / Andrei Rublev (1966) plunges us into Russian devotion and turmoil in the early 1400s. This astonishing mostly black and white film carves out a place for cinema as distinct from other forms of art. It is highly esoteric, in this way rivaling films by Werner Herzog and Jean-Luc Godard. A list of its closest cousins would include Ingmar Bergman's Det sjunde inseglet / The Seventh Seal (1957) and Monty Python and the Holy Grail (1975). Steve Rose's "Andrei Rublev: The best arthouse film of all time" (The Guardian, October 20, 2010) covers the film nicely: "For the next three hours, we're down in the muck and chaos of medieval Russia, carried along on the tide of history through gruesome Tartar [Tatar] raids, bizarre pagan rituals, famine, torture and physical hardship. We experience life on every scale, from raindrops falling on a river to armies ransacking a town, often within the same, unbroken shot. . . At times the screen resembles a vast Brueghel painting come to life, or a medieval tapestry unrolling." For the full article, here is a link. The Russian medieval backdrop is wild: historically, the Tatar raids and invasions lasted for something like five centuries. If anyone wants to understand the Russian psyche, think about that! There was no savior to get them out of it, no "7th Cavalry." It was what is was: grim and provisional, the Myth of Sisyphus writ large. All the while, the Tatars were basically enjoying themselves, not unlike the Vikings: raiding, plundering, regrouping, then raiding again. Tarkovsky is masterful at showing them in action: they ride into a village, then with great relaxation almost, they go about wrecking things, killing some people, carrying off others, joking all the way. It's an absolute nightmare for homebodies. They leave things only partially destroyed. Why? So the villagers can repair the damage and then be raided again by the same or different Tatars. Here, the aftermath of a Tatar raid. A church is torn up and burning, while Andrei Rublev is left to pray. If you look carefully, you can see a black cat enter from the right side of the screen. Horses had trampled through earlier. Beautiful icon paintings are going up in smoke. In the end, looking back from the 21st century, the Tatar raids were finally put to an end. 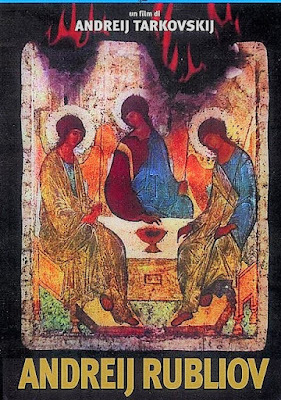 Some of Andrei Rublev's icon paintings remain, and they are beautiful. Is life on earth worth it? You tell me.